But God had plans for Daryl. Plans to truly prosper him and not to harm him. And Daryl is listening. 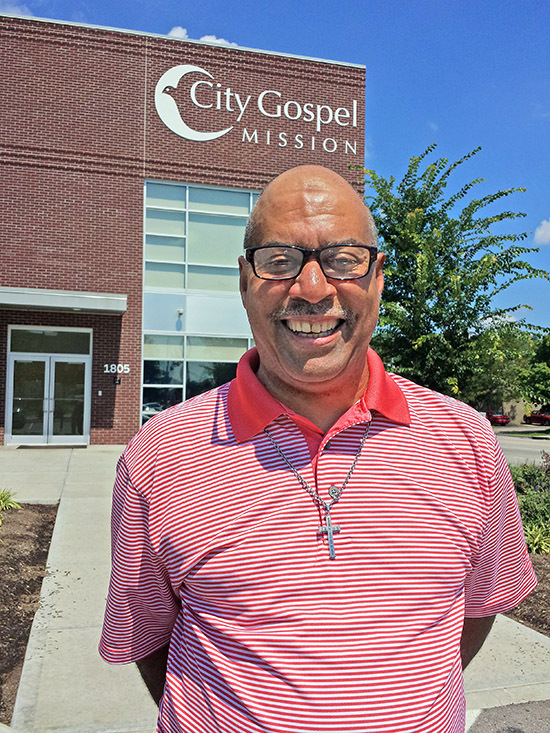 “I have realized this place, City Gospel Mission, was a foundation,” he says. Since November 2015, Daryl’s life has gradually been restored. After a long battle with drugs and alcohol that saw him mostly absent from his three daughters’ lives, his family is being restored, too. While in the shelter, he learned about the death of his oldest daughter – hit by a drunk driver. “I couldn’t stop crying,” he says. Now, he’s determined to be active in the lives of his daughters, and especially in the lives of his grandkids. He is determined to be there for them and has steadily rebuilt those relationships. So when he finally began thinking of moving out of the shelter after getting a job as a community facilitator with City Gospel Mission and saving enough money, his struggling youngest daughter came to mind. Not just because she and her four kids live in a bad neighborhood and he wants to get them out of there. But because he wants to be there for them. “When the Lord put that in my spirit, it was stamped,” he says. Daryl didn’t always do the right thing, particularly after his mother died when he was 19. His father was never in his life. He never knew his grandparents. Is this 56-year-old ready for four kids – 1, 5, 8 and 9? “Oh yeah,” he says, laughing. But he knows he needs God’s help. So he has been taking the kids to church. His daughter is working two jobs and making sure her kids are going to a good school. Now they have a safe place to call home. Tim Curtis is the Communications Director at City Gospel Mission. He can be reached at tcurtis@citygospelmission.org. Daryl I am honored to have you as a friend and a brother in Christ. This is only the beginning of a fruitful life. May God continue to be your refuge and strength. I love you brother. I am truly touched and inspired by Daryl’s story. It is a great example of how the Lord is always present and working in our lives, even when we refuse to open our hearts to him. He is waiting with open arms to receive and bless us. It is also an example of how we can make a difference by even the smallest of time or money to City Gospel missions. We can help people, save lives and change the world one person at a time. Daryl, bless you and your family. Never give up, stay faithful in the Lord and he will guide you through the darkest and the brightest moments in your life. I feel honored and truly blessed to have met Daryl. He has been a true inspiration in my life and has given me a great gift. I pray for many blessings in his life as he continues to move forward in many positive ways. Praise God. Daryl your story is truly an inspiration. You are living proof of the goodness of our God. I know you said you are scared (understandably so), but I encourage you to read Isaiah 41:10. Hallelujah to God on high!!! I won’t forget you, and you and your family will be in my prayers. God bless you! Daryl story is touching and lets me know no matter what your age or situation God has your back!…..